Begin by talking to Burntmeat in the Troll Stronghold. Start by talking to Burntmeat in the Troll Stronghold. He will tell you the story of a fearless adventurer who had Goutweed on him when he was captured by Trolls. Of course Burntmeat cooked the poor man but not after grilling him about the Goutweed he had on him. The poor slob spilled the beans. And his intellect befitting Burntmeat realizes that Trolls should be able to grow it too. But for this he needs your help. He will need a Troll named My Arm to learn how to farm, and as part of your reward he promises to never cook a human again. He will tell you to talk to My Arm who is near the Goat Pen a short distance east. Of course you are a little puzzled by his name and My Arm will explain to you how he came by it. In short: Every Troll gets named after the first thing they tried to eat. The "my arm" refers to the arm of his father. My Arm will send you to Death Plateau to collect a Goutweedy Lump from a Cauldron there. To get this out of the Cauldron, use an empty bucket on it and it will appear in your inventory. Return to My Arm and he will eat the darn thing. Next he will take you to the patch where he tried to farm. It is on the roof of the Troll Stronghold with the ladder to access it close to the Troll Generals. He will also give you a Farming Manual you need to read, in order to learn how to grow Goutweed in the mountains. If you didn't bring the three buckets of Camel Dung with you there are two ways to obtain it, one easy and one hard. The easy way requires you to have finished Enakhra's Lament and a Camulet. Wield the Camulet and talk to any of the Camels wandering about in Al Kharid and they will drop the droppings on request. Scoop the poop with your bucket and you have the dung you need (This only works when you reach this part of the quest, you cannot get it prior to it). The hard way is to travel to Pollnivneach, buy a bottle of hot kebab sauce from the Kebab Salesman and use this on the food trough in the enclosure behind the Camel Salesman. Once the Camels eat from it they will drop enough to fill 4 buckets. 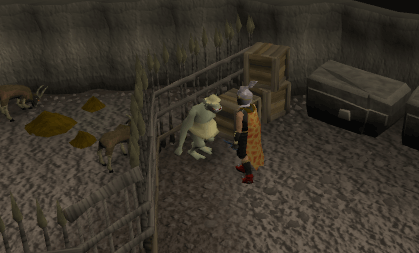 There is a bucket spawn at the Camel Salesman. 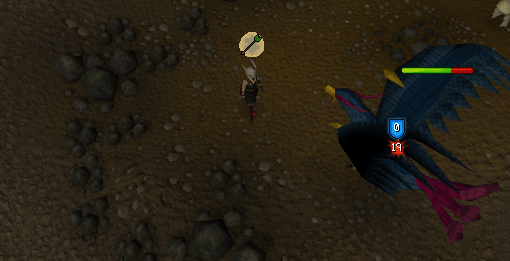 Once you have them teleport either to Burthorpe with a Games Necklace or to Trollheim with Trollheim teleport. 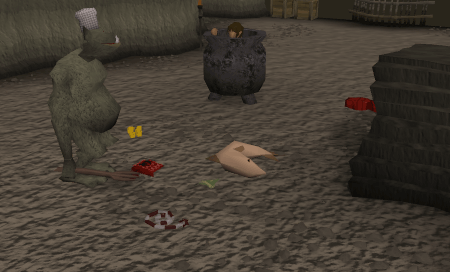 On the roof of the Troll Stronghold there is a Tool Leprechaun who also functions as a limited farm shop. So if you have Super Compost stored with him there is no need to bring it. If you didn't you will need 7 buckets of Super Compost in your inventory. Use the Camel Dung and Super Compost on the Soil Patch then talk to My Arm again. He will tell you to travel to Tai Bwo Wannai to get some Gout Tuber. The both of you will take a boat ride to Karamja, My Arm acting like a child who keeps asking when you will get there. And of course he will tell you to meet him at Tai Bwo Wannai the moment you set foot on land. Head over to Tai Bwo Wannai and meet up with My Arm a little east of the General Store. Talk to Murcaily at the entrance of the Hardwood Grove and he will tell you you need your favour to the village up to 60% before he will give you a Hardy Gout Tuber. Now you will need to do chores around the village to get your favour up to 60%. Be careful if you didn't bring Anti-Poison Potion, the snakes and natives springing from the Jungly you chop down can poison you. When your favour is at 60% return to Murcaily and talk to him. He will give you your needed Gout Tuber and My Arm, getting a little impatient will start some trouble, or, Rumble in the Jungle. Murcaily wants you to get rid of My Arm and pays you in..... Hardy Gout Tuber. Now go back to My Arm and talk to him. He will advise you to go to the bank in Ardougne because a "Really Big Bird" gets interested in anything he ever planted. 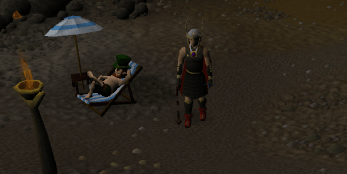 A nice boat trip back to Ardougne and My Arm will tell you to meet him on the roof of the Troll Stronghold. Prepare for battle what ever way you see fit: You will need to fight a level 75 Baby Roc who will not be much of a problem, but after that a big one appears: level 172 and prayer will only protect you against one of the three attacks. Mage-ing or Ranging seems the best option as you will be tossed around when you Melee her. 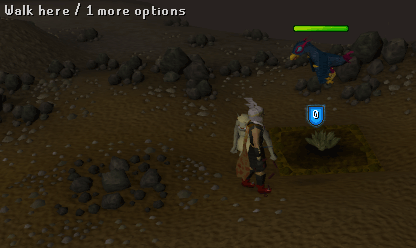 Level 40 Prayer and a Prayer Potion will also make the battle much easier. Return to the Troll Stronghold and climb to the roof. Help My Arm to plant the tubers. Do this by using all the items needed for farming in the correct order: Use a Rake with him, and he will start raking the patch vigorously, and break the rake. Next use the Gout Weed Tubers with him, followed by the Seed Dibber. 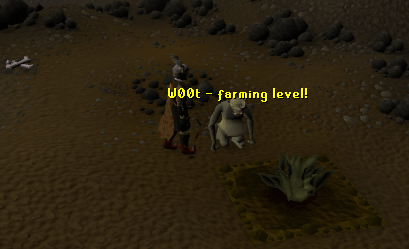 He now will have learned how to farm. The herb patch may become diseased, so at this point you might need to give him some plant cure, which can be bought for 52 coins from the Tool Leprechaun. As he promised, a Big Bird is showing interest in what he planted. First you will have to fight a level 72 Baby Roc. After you kill it, you will have a short break where you can do whatever you want. Speak to My Arm again and behind you will appear a level 172 Big Roc. This monster has two types of attacks, although it is best if you look at it as three. The first a close melee attack in which you are knocked across the mountain and you will see stars for a few seconds before you can get back in the game. It is highly not recommended that you melee her because she will toss you around like a rag doll and follow up with the other two attacks while you are dizzy. The second is a long distance melee attack where the bird sends a gust of wind at you. It may sound like a range attack, but your prayer wont help you against it. It will still knock you off your feet like the first attack, but if she is using this on you, there is a good chance there is a rock wall behind you to break your fall. The third is the ranged attack. This is where it starts to get really ugly. The Big Roc will pick up rocks and throw them at you. These rocks will come fast and hit in the teens often. It is also the most commonly used attack when you are ranging it, however there is still hope. If you turn on protect from missiles, the Big Roc will not use this attack, and whenever the attack would have been used, Big Bird will completely skip that turn. Bring a prayer pot if you think you will need it because this is one attack you don't want to face. The general consensus is this is a very hard monster to deal with. For those with a low Defence level it would be wise to stand back and either range or mage her. It helps if you get into the north east corner to do the ranging because it is a known spot that will keep you from getting thrown and there is a wall to break your fall if you are hit by a gust of wind. Melee players may stand in front of a rock to avoid being pushed back by the strong gusts of wind created by the Big Roc. Now hand a spade to My Arm and he will start harvesting the Gout Weed from the patch. The leprechaun will have ran away so go down the ladder and back up if you need to take a spade from him. You will receive any farming experience related to what he harvests. And My Arm will even level his farming. Aware of the shabby rewards normally handed out by Burntmeat, he then tells you to return to him after you have reported to Burntmeat. And true enough after speaking to him every single free spot in your inventory is now filled with burnt meat. Head back to My Arm and speak with him to receive a proper reward: Quest finished! 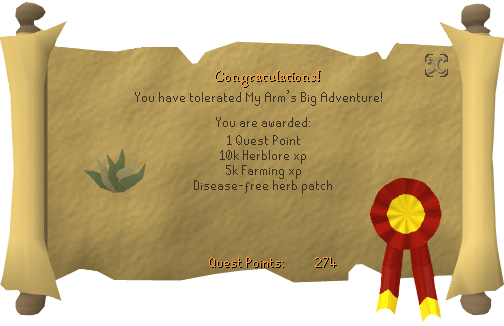 10,000 Herblore experience 5,000 Farming experience Access to a disease-free herb patch.